Apple slipped in quite a few surprises yesterday, with the discontinuation of the iPhone 5c being one of them. While we were somewhat expecting Apple to make the move to kill off its plastic clad handset, but what we didn’t expect was Apple completely doing away with the gold color option on the iPhone 6, iPhone 6 Plus or the iPhone 5s. 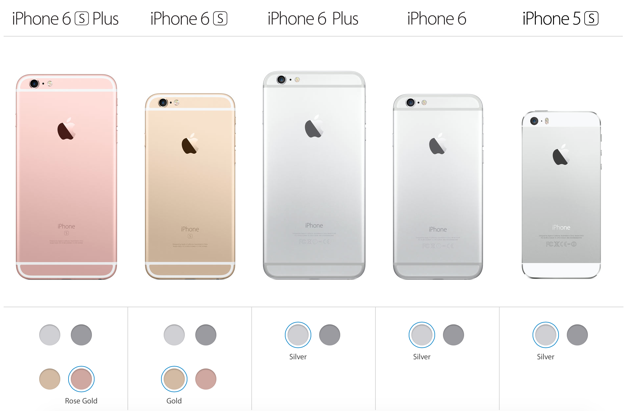 If you take a stroll through Apple’s website then you’ll be pleased to learn that the iPhone 6s and the iPhone 6s Plus are available in a brand new finish – Rose Gold. The interesting thing to note here is that while Apple has added a brand new color to the roster, it also took the courtesy to offer the iPhone 6, iPhone 6 Plus and the iPhone 5s in only silver and space gray options, killing off the gold variant altogether on older handsets. Effective immediately, the change might not be a welcome one, especially for those who been waiting for the iPhone 6 and iPhone 6 Plus to see a price drop so they can grab last year’s flagship in gold on a discounted price. Not good news for gold loving fans at all. Fret not though, if you’re residing in the United States and always wanted to grab yourself an iPhone, then you’ll be pleased to learn that Apple has launched a new ‘iPhone Upgrade Program‘ that lets you buy Cupertino’s latest and greatest handset in easy installments that can be spread over a course of 24 months. Given the iPhone Upgrade Program, and if you happen to reside in the United States, then we would suggest potential buyers go ahead and make the leap towards the iPhone 6s and iPhone 6s Plus instead. After all, Cupertino’s latest flagships are packed to the rafters with a ton of new features with the marquee one being the 3D Touch display, that can sense three levels of pressure – a touch, a press and a deep press. In the camera department, the iPhone 6s and iPhone 6s Plus are taking the megapixel game up a notch with a 12MP sensor being the order of the day that can also shoot videos in 4K as well. To sweeten the entire deal, Apple is also tossing in Live Photos into the mix. Gold or not, if you’re in the United States then we urge users to go ahead with the iPhone 6s instead as the iPhone Upgrade Program is a great way to get the latest flagship device without busting their bank.